Posted By:LovelyLocks | At:3:15 PM Be the first to comment! 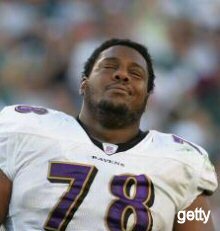 Nicknamed "Zeus", Brown was a formidable opponent on the field and a great off the field asset to the Ravens organization since he retired from active play in 2005. As of now officials are reporting that his death does not appear suspicious and foul play is not suspected. Brown, 40 years old, was discovered in his Baltimore apartment today. In a statement today, Ravens linebacker, Ray Lewis said, ""He was the original Raven. He set the tone for how we were going to play tough and physical, backing down from no opponent." The Savvy Sista family would like to express their condolences to his family, especially his 3 sons.